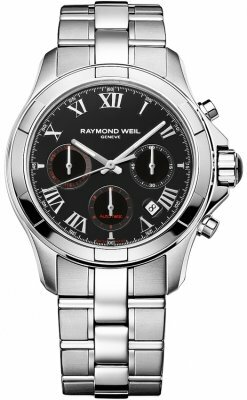 Large selection of in stock and discounted Raymond Weil watches on sale at Prestige Time. Excellent customer service and free shipping. Like a symphony, where all elements must come together at a precise time to create a masterpiece, the Raymond Weil watch uses its components in perfect harmony and keep perfect time. As a fan of performance arts there are many musically themed Raymond Weil timepieces such as the Tango, Parsifal, Raymond Weil Maestro, Tradition, Noemia, Jasmine & Raymond Weil Toccata. Raymond Weil watches is a true aficionado of fine arts, with his daughter being a professional pianist and many musically themed Raymond Weil watches named the Tango, Raymond Weil Parsifal, Maestro, Raymond Weil Tradition, Noemia, Raymond Weil Jasmine, Raymond Weil Toccata. So too, performance and creativity carries true with in Raymond Weil watches. Like a symphony, where all elements must come together at a precise time to create a masterpiece, the Raymond Weil watch uses its components in perfect harmony and keep perfect time. As one of the last independent Swiss watchmakers, Raymond Weil celebrated their independence in 2007 with the Men's and Ladies Raymond Weil Freelancer watch. At Prestige Time, we carry a large selection of Raymond Weil watches on sale and offer free shipping when you buy a Raymond Weil watch. Raymond Weil Freelancer collection is filled with a variety of styles and features both watches that are classic and sporty watches that vary in size and appearance. Some of the larger Raymond Weil Freelancer chronograph watch models include a chronograph complication (stopwatch function) and these watches have some pretty exclusive looking dials. Other Raymond Weil Freelancer models display an open heart (visible balance wheel) on the dial that let's you watch the movement in action. A special Raymond Weil Freelancer David Bowie limited edition was created in honor of his 70th birthday which shows a red lightning bolt at the 12 o'clock position. 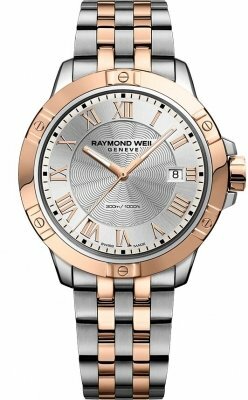 Raymond Weil Tango collection features several watches ranging in size from 30mm for ladies and going all the way up to a 43mm case size for men. 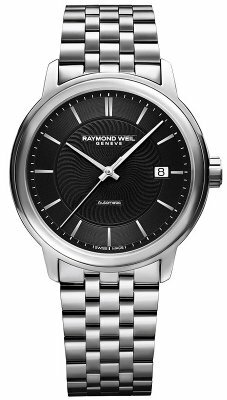 For the most part, the Raymond Weil Tango collection uses steel bracelets but there is a specific Raymond Weil Tango model # 8560-sr-00206 which comes on a ribbed rubber strap. The rest of the Raymond Weil Tango models in this collection are either on a stainless steel bracelet or a steel and gold plates two tone bracelet. Raymond Weil Maestro collection can easily be spotted by its classic round cases and textured guilloche dials. Some Raymond Weil Maestro automatic watches in this collection feature a Maestro automatic with a skeletonized dial or even an "open heart" where you can see the balance wheel in action. With Raymond Weil Maestro watches in a variety of different colored materials from steel to yellow gold and rose gold toned PVD plating and with a number of different types of straps and bands, one is sure to find something they like in this collection. 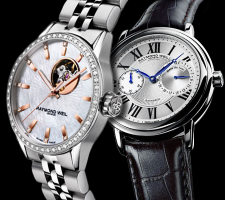 Raymond Weil Toccata collection is a collection of men's and women's watches that is filled with some exquisite watches that are designed with clean lines and a timeless classic look. 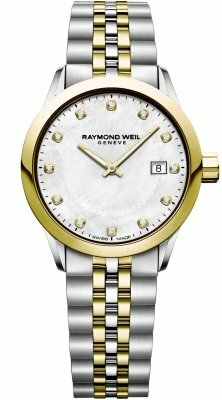 Some of the women's Raymond Weil Toccata watches in this collection feature mother of pearl dials. Others feature sunray dials with diamond hour markers and small running seconds sub-registers. 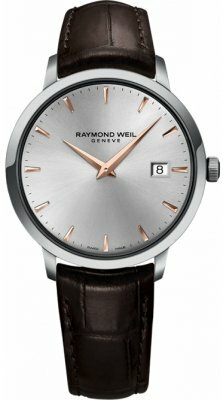 While most of the Raymond Weil Toccata watches in this collection come on a metal bracelet, there are also several models that come on a leather strap. Raymond Weil Parsifal collection can easily be spotted with it's larger, chronograph watches. These watches feature a black dial with large high contrast silver Roman numerals. The Parsifal uses a red printed index on the chronograph sub-dials and has a date window that can be found between the watchmaker's IIII and V Roman numeral. You can find the Parsifal on either a leather strap or a stainless steel bracelet. 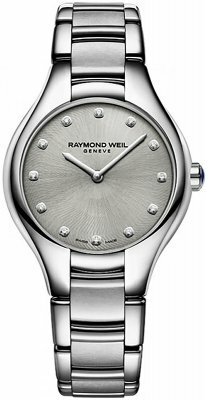 Raymond Weil Noemia collection is the most feminine of all Raymond Weil's collections. The Raymond Weil Noemia watch series features smaller watches ranging from 24mm to 32mm with bracelets and cases in stainless steel and gold-plated steel. Several Raymond Weil Noemia models feature a pale, pastel colored dial or a mother of pearl dial with small diamond hour markers.